"Just Passing Through" is the name of the third scenario for Counterattack, an expansion set in the World at War universe. 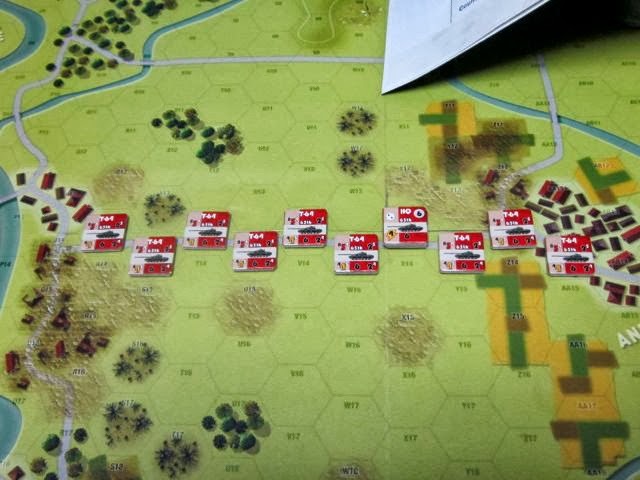 This scenario features two formations of Americans (the A/1-8 mechanized infantry and Echo tank company) trying to sweep into the Soviet salient as it advances into France during the early summer of 1985. 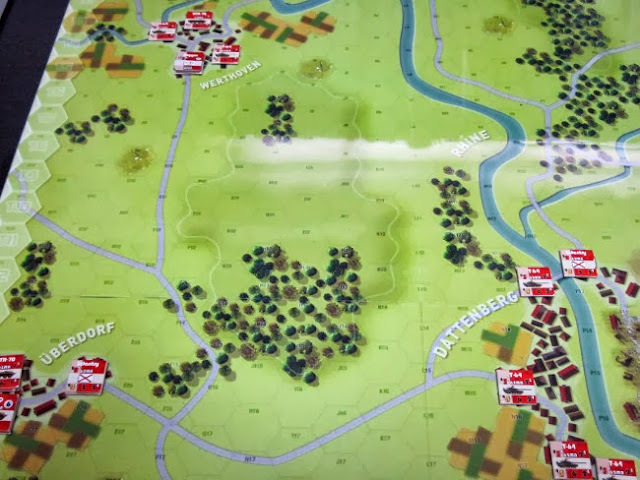 Played on the Blood & Bridges map, the Americans face off against the 62nd Motorized Rifle regiment in an effort to take the cities of Uberdorf and Dattenburg. These days, in between bouts of 7th Fleet and Nations at War, I've been having fun playing the World at War expansion, Counterattack. After playing through its first scenario, "Dial 411 for Information", the second scenario, called "One Thing At a Time", was quickly set up on my table over the weekend. The background here is that NATO is desperately trying to stall the Soviet advance into France in early June of '85. In order to stem the tide, the Americans send in a special group of Sheridan tanks behind the front lines to hit at reinforcements coming through Dattenberg. The Soviets will score VPs by both exiting units off the west side of the map and taking out the Sheridans.